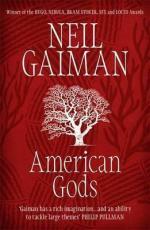 American Gods, the extraordinary, highly acclaimed epic novel from storytelling genius and international bestseller Neil Gaiman, was brought vividly to life this year in the hottest major TV show of 2017, and Amazon Prime video series starring Ricky Whittle, Ian McShane, Emily Browning and Gillian Anderson. For fans of The Book of Dust and Mythos by Stephen Fry. After three years in prison, Shadow has served his time. But as the days and hours until his release tick away, he can feel a storm brewing.Two days before his release date, his wife Laura dies in a mysterious car crash, in adulterous circumstances. Dazed, Shadow travels home, only to encounter the bizarre Mr Wednesday, who claims to be a refugee from a distant war, a former god and the king of America. Together they embark on a very strange journey across the States, along the way solving the murders which have occurred every winter in one small American town.But the storm is about to break . . .